Eco-protestors have taken over London, and the costs are already racking up. Extreme environmental activists, who call themselves the “Extinction Rebellion,” have caused mass disruption in the city, with protestors taking over bridges and squares, shutting down traffic and bus routes. The extremists say they want to “pause” cities so that countries become carbon zero by 2025. Notably, eliminating all fossil fuels in six years is not technically or economically feasible. But in typical eco-group form, facts aren’t part of their equation. Sounds harmless? Not at all. Their “pause” has become a mass disruption of economic activity and the transportation system. They say they want to “shut down London” for weeks, and are using militant language, calling for “reinforcements” to help maintain one of their roadblocks. In fact, the BBC reports that 500,000 people have been affected by the protests so far due to blocked bus routes. As CNN reports, London retailers have already lost $15 million during the last two days. Stores are reporting a 25% decrease in sales. 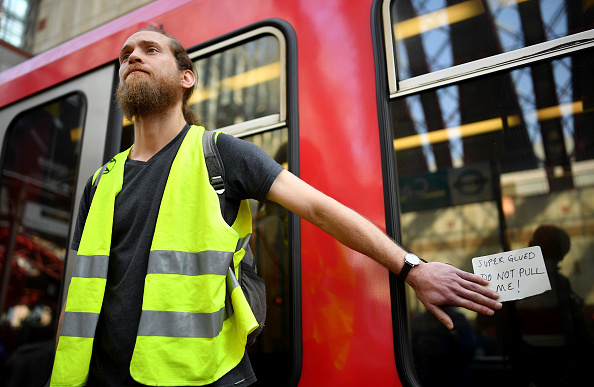 Now, activists are taking it to a new level, actually gluing themselves to trains “to hold themselves in place and prevent officials from removing them.” Around 300 protestors have already been arrested. Shutting down a city, wrecking the economy and hurting the livelihoods of everyday people is not the way to get what you want. And for environmentalists, who generally support public transit, shutting down transit systems doesn’t even make sense. These protestors are unhinged. It’s time for them to stop.